The Infiammati Dub project was born back in year 2012 in Bitonto, Apulia, Southern Italy. Giuseppe, Gwada and Giuseppe Teofilo, appeared as a crew selecting in bars and with the local sound systems. Their vibes were received with great joy and it was only a matter of time to evolve and take the next step …. And they did indeed evolve into a heavyweight soundsystem touring the land and spreading the positive vibrations, alongside many of the most known soundsystems of the country. 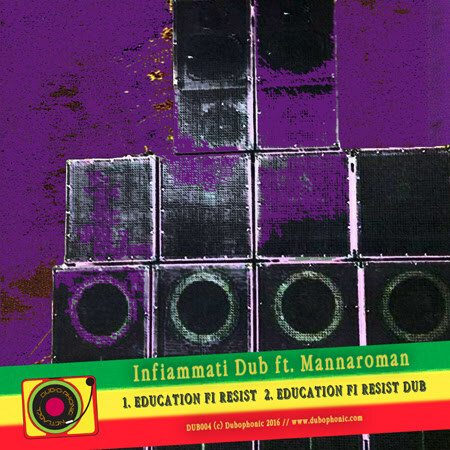 Infiammati Dub participated as a soundsystem in many dub festivals, spreading the conscious vibrations and also stared working on their own music, which many times is performed live on their soundsystem. Soon the first productions started emerging from the local soundsystem culture. Their sound is majestic and every time they drop a tune, it’s like a warrior gathering. 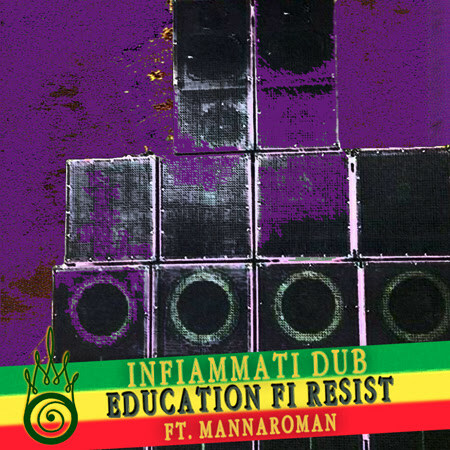 "Education Fi Resist" is a heavyweight warrior’s stepper and features the chanting of Mannaroman. It is presented as a digital single in two different cuts. We hope you feel the vibes!